If you are planning to drink and drive in Lexington County in may be best to take a cab, according to Sherriff James Metts. The State Newspaper is reporting that Sheriff Metts and his deputies, along with state troopers and municipal police will be stepping up patrols in “trouble spots” around Lexington County including areas around S.C. 6 and Red Bank, as well as, parts of U.S. 1 and U.S. 378 along the south side of Lake Murray. The Lexington County DUI crackdown comes after Sheriff Metts urged bar operators in a dozen bars around the troubled spots to stop serving intoxicated patrons, and arrange for these patrons a safe ride home in an effort to make Lexington County roads safer for all. Metts would not directly identify the bars his force is targeting. A citizen advisory panel recently warned Metts and other Lexington County officials stating, “There is a high level of over service” at bars in the county. The advisory council, Lexington-Richland Alcohol and Drug Abuse Council, is trying to persuade bar owners to allow the council to train and help employees identify and assist intoxicated customers. Most of the 300 bars in the county are ignoring LRADAC’s offers, states advisory panel coordinator, Caroline Humphries. LRADAC hoped by bringing their services to the sites they would be able to educate bar employees, but bar owners were still unwilling to oblige. According to Humphries, bar owners said they were too busy and reluctant to confront regular customers. Lexington County currently leads the state in roadway and pedestrian fatalities. Metts says, “Alcohol is the real issue” as to why so many deaths occur. LRADAC states there is a large perception in Lexington County from motorists that there is little risk of being caught for DUI on county roads. Metts hopes to change motorists thinking. “Our blue lights are going to be out,” Metts states. He says his deputies are “being a lot more visible” in the troubled spots of Lexington County. So far, this year 40 people have died on Lexington County roads, this is up from 34 deaths during the same period last year, and up from 29 deaths during the same period in 2010 and 2009, state records show. 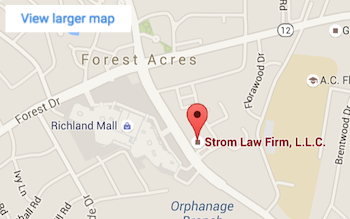 The Strom Law Firm encourages those planning to drink and drive to call a cab instead. A DUI in South Carolina carries stiff penalties including steep fines and potentially jail time. A DUI can affect you long after you pay your fine, and/or your serve your time. A DUI conviction can lead to a loss of your drivers’ license, loss of employment, and a permanent mark on your criminal record. The South Carolina DUI lawyers at the Strom Law Firm can help clear your name of DUI charges. Call us today or fill out a web form to see how we can help you. We understand what is stake that is why we will fight for you. 803.252.4800.